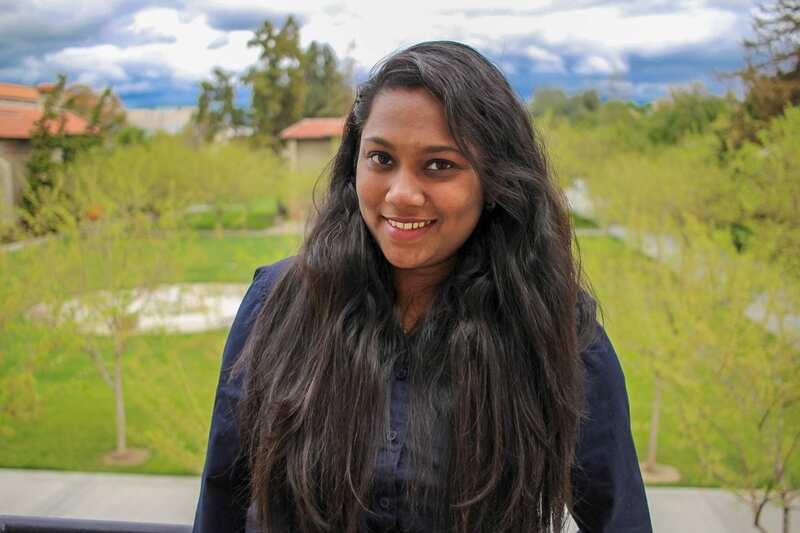 Meenakshi Anbukkarasu is a first year Graduate student that is majoring in Computer Science. She, along with Rashmi, help faculty, staff and students with all things related to instructional tools, Canvas and Adobe programs. She is expected to graduate in May 2020 but for now, she is enjoying her classes and her work here at eCampus. When I first met Meenakshi, I could instantly tell she was a kind and welcoming young lady. She is the co-worker everyone deserves. In the mornings my co-workers and I are greeted by her gentle smile and a warm, ‘Good Morning’. If she sees that we are stressed over our work or school, she will always try to help in any she can. I think that is important in any work environment. Sometimes, we are all at fault for not reaching out for help but Meenakshi always offers a helping hand showing her true leadership qualities. When she first got here, she (like everyone) had to go through the training process. I was highly impressed by how fast of a learner she was. She would always be asking questions and asking us, “what if” questions. I believe this really helped her prepare herself to know what to do in a variety of situations. I related to that and maybe that’s why it was so easy for me to work with her. I am always asking questions so that I can grow and be the best possible employee. For 4 months now, I have seen Meenakshi help students and faculty with their technical issues in a professional manner. When I asked her, what was her favorite part about the job she said, “The amazing thing about working in eCampus is that I get to meet and interact with a lot of people every day. You learn something new and you are constantly growing. The exploration you do to solve a case is fun and challenging. I also get to work with amazing co-workers and a very understanding director. I’ve never felt bored with my work since every day is different. I always have an excitement to go to work every morning. Overall, I’ve grown a lot a person in these past 4 months here at eCampus and I know I will continue to learn and grow while I am here”. After graduating she plans to be a Software Developer for a top company like Google, Amazon or Facebook. Her aspirations don’t stop there as she one day hopes to be the CEO of her own company. It’s only natural that a person like Meenakshi who loves to learn also loves to teach. She says, “I love teaching! I’ve taught at a few summer camps back in India. I want to inspire girls to choose a career in STEM. I wanted to continue that work in California, so I joined as a volunteer at West Valley Branch Library in San Jose to teach middle school kids some basic programming languages”. Meenakshi’s love for inclusivity and empowerment for women in STEM fields has impacted students in India and here in San Jose. Wherever life takes her, you can find her inspiring others and working to make the tech world more inclusive.